So excited that these dies are finally here! I've been wanting to scrap some layouts with Miss Kitty for an album and make some pillows too. I know, this picture is kind of crooked but I had to work with little light in the room and this was the best angle to catch the light. But, these dies fit perfectly on a card front. I put glitter on the flower petals. And you can see the glitter here. Also used some Hero Arts gemstones for the bling and a Hero Arts flower. Well, I'll be showing a bunch of items made with these new dies on The Joy of Crafting show in November. So cute, Cheryl! Now I'm gonna have the get these dies!! These are soooo cute!! I need to get these!! 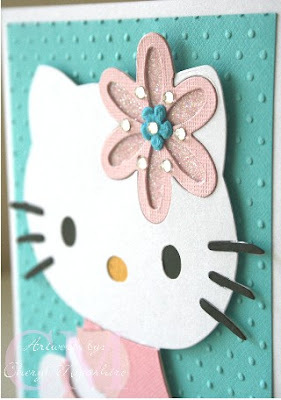 this card is adorable! 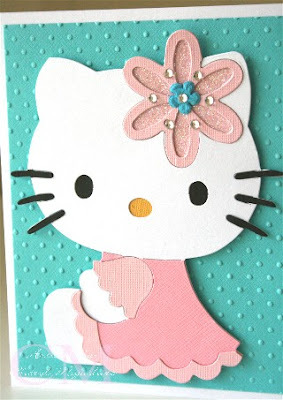 i loved hello kitty as a little girl ... i think it's great that she's still around!